Heat a small amount of oil in a nonstick pan. Saute the fennel until softened and lightly caramelized. Add the fennel to a food processor. Pulse into small bits. Add the spinach and pulse twice. Add the remaining ingredients and pulse until a relatively smooth dip forms. I'm back with more fennel. I've been buying it a lot lately because 1. it must be in season somewhere because the bulbs have been huge and beautiful lately and 2. our local grocery store has switched to pricing them by the bulb vs. per pound which means no more $10+ bulbs! Love that. I also picked up some spinach because it was on sale and I want to increase our iron intake. I was planning something else with the spinach but our dachshund, Pippi (seen here enjoying Pineapple-Chile Paletas), had to have emergency back surgery. I skipped making dinner that night, of course! She's recovering now at the vet's office so I am trying to keep myself busy by making food. Somehow we ended up with pretzel chips, pita chips and tortilla chips in the house so dip sounded like a good idea. I found this blend of Greek yogurt and cream cheese near the cream cheese at the supermarket and bought it not knowing what do with it. I spied it while looking for sour cream in the fridge so into the dip it goes! It helps this dip stay on the healthy side. Hey, this dip has veggies and protein and low fat dairy. You can't get better than that in a dip! 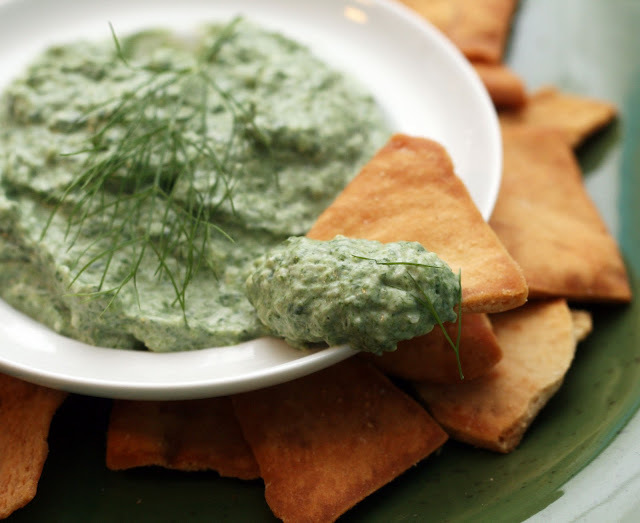 The fennel gives it a slightly sweet depth of flavor and well, who doesn't love spinach dip? I like mine fairly smooth so I pulsed it a bunch but if you want a chunkier dip, add the spinach at the end instead of the beginning.